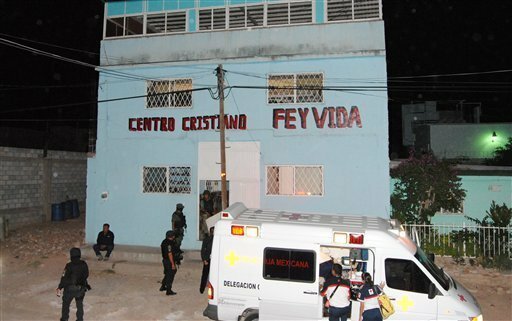 Nine people were killed in attack on a Mexican drug clinic in northern Mexico, when dozens of gunmen stormed the private facility in the city of Chihuahua. Mexico is controlled by the drug cartels that operate throughout the country without any fear of impunity. This incident adds to a long list of violent murders that have taken place in drug treatment facilities. Ex-cartel members will hide out in places like Fe y Vida, or Faith and Life, to either change their life or to recruit new members. This has brought on a number of murders inside treatment centers in the past year, catching a number of innocent people in the crossfire. The LA Times reported that, "Rene Castillo, the center's pastor, said the men, outfitted with protective vests and face masks, first claimed to be police officers. They fatally shot some of the victims in their rooms, but herded most outside the three-story center before executing them". Martin Sandoval, once treated at Fey y Vida, lives close to the treatment and was able to hear the gunfire; he claimed that he knew several people at Fey y Vida and that some had been part of the Mexicles gang, who has rivaled with another violent gang the Aztecas for control of drug trafficking routes through Juarez. Sadly, not every person murdered last week was a member of the cartels; some people were legitimately trying get their life on track when it was taken away. One's innocence and repentance has no bearing on whether or not the cartels will take your life away. More than 23,000 people have been killed in Mexico since December 2006, when President Felipe Calderon vowed to combat the cartels and ordered troops to fight them. The war for control of Mexican drug routes will continue to wage on because the cartels control more than just the drug trade - they control the entire nation.